When HorrorCultfilms was just starting out, my review of Scre4m caused a bit of a stir. Giving the film a four star rating and praising every single frame of it, I was targeted by readers and my fellow writers of having lost the plot. Maybe I was a bit biased at the time as my love for the Scream franchise is well known in the office of HCF and having hated every moment of Scream 3, I thought and actually still believe that the fourth chapter gave back much creditability to be the character of Ghostface, thanks to a movie that was violent and served up great characters and a twisty plot. Sadly my love did not follow along with the masses and while it was well received by the fans, any hope of a further sequel was gone thanks to the not so much eye watering box office figures in America, even though the film did really well else where. I said at the time that this was not the last we had seen of Ghostface and his blade. The franchise was too well known to simply die and I was 100% sure that we probably would get a straight to DVD offering or in a few years a dreaded remake, because the killer itself has now joined the ranks of Michael Myers, Freddy , Jason and co, in that the brand will sell, even if you cut the budget and make a cheaper version. What I did not expect though was the franchise to head to the land of TV, I mean Slasher hitting the small screen? What next? Jason Voorhees getting his own origin tale like GOTHAM, showing how he got his blood thirsty tendencies? The only time I have seen Slash do well in this format was with the very underrated Harper’s Island and if you notice, I used that term “Underrated!” Why? Well despite much love from the fans of the genre and I admit its a brilliant series, the show failed to find an audience and was unfairly quickly axed after one series, so to make a Scream TV show is either a brave or quite stupid idea! Its obvious MTV are hoping the title itself will sell and no doubt many fans like myself were glued to their seats last night for the pilot, but what did we actually get? Was it more Scream 2 or a Scream 3 and did the franchise miss the main ingredient of its creator Kevin Williamson and the directing nous of Wes Craven? From start, the show does the wrong thing and tries not to move away from its blueprint. I don’t know why, but it seems that those in America forget that the original Scream in a “classic” horror movie, a film that created a mini boom of slash genre in the 90’s, much like Halloween did in the 70’s. The last two sequels may have knocked the franchise a bit, but at times I wish those behind the camera would treat Ghostface with the respect he deserves. My point is, 1996 was all about Scream for horror fans and the beginning with Drew Barrymore still ranks as one of the best moments in horror, so why then in 2015 are we seeing a TV Show trying to recreate that scene? I mean why? There is nothing wrong in hindsight of making a show out of a classic film, Bates Motel has taken the material of Psycho and done something wonderful, so if Scream was going to do it, they should have been brave enough to start off the pilot with a different slant, I mean we have seen this opening twice now, once in the original and in “Stab”, the film poor Maureen was watching at the start of Scream 2, so I had no thrill to see this montage again. Yes, there are a few modern touches, there is no phone dialogue, just the reading of texts, but if anything, this opening just came across like a watered down version, lacking flair and any creativity. Harsh, I know! But then the actual show begins and its like watching a parallel universe. I mean who we see in front of us should be Sidney, Billy, Stu, Randy and Tatum, but actually are Emma (Willa Fitzgerald), Will (Conner Weil), Jake (Tom Maden), Noah (John Karna) and Brooke (Carlson Young), with only a Gail Weathers and a Deputy Dewey counterpart missing from the list. Woodsboro is replaced by the town of Lakewood, and scenes that make you want to chuck on the original films and see how it should be done. Noah is the new Randy, even goes as far and tells a class full of students how the slasher genre can only work on TV. Doing this same scene we get the obligatory list of great TV Shows like American Horror Story, (this moment is soooooooooooooooo much like Scream 2 it actually hurts) and later on at a party, he goes on about the rules one must obey………well you get the idea. But what about the plot! Well this is where it gets peculiar and why I have feelings of confused running through my body. The killings seem to be linked to that of a viral video that has hit YouTube of Audrey (Bex Taylor-Klause) making out with a girl in a car. But while I could yawn at that, there is a hidden sub plot that has me quite intrigued. Like them all, the town has a mysterious past! Twenty years ago, a young boy named Brandon James was suffering from proteus syndrome which gave him deformity. He kept himself in his bedroom, wearing a mask to hide his face, his parents were ashamed and he had no friends, until one day he fell in love with a young girl called Daisy-hence the quite nice spooky music theme. During a Halloween dance, Brandon approached the young girl and they hit if off, until he took of his mask and the young teen screamed, the boy was beaten up by a bunch of jocks, but he got his revenge later, by killing them all in a murdering spree, which resulted in Daisy being used as a pawn by the police to capture the young boy who was later shot and fell into a lake and his body was never recovered. In a mid pilot twist, Daisy is revealed to be the mother of Emma, now carrying the name of Maggie (Tracy Middendorf), which on the day after the first killings, gets an animal heart delivered by post, with a message that someone knows her secret!…… Now that has me really stumped, but in a good way. How is the mystery past of Brandon linked to the modern killings? As the drowned boy now gone all Jason on us? Why does it tie in to the viral video? Or does it? Are we looking at the usual Scream stable of two Ghostface killers? Probably! Damn you for making me want to know, as despite my many misgivings, and believe me I have loads, there is enough of the plot here to get me interested in all this. Scream TV is just as bad as you could imagine but also as hints that it could develop into something worth a watch. The bad moments are too many to list here, but one thing I will point out that really grated me, I love the new look mask, I really do, its a kind of Myers/Ghostface combined and its sweet…….but if you are going to do the voice of Ghostface, then get Roger L. Jackson back…..please….I beg you….I double beg you, listening to the new wannabe is like listening to someone else doing a bad impression of someone you love. But then that sums up everything about this weird adaptation, its like a “you can’t take your eyes off it as you can’t believe this is happening” kind of thing. At the moment I have no idea who the killer/killers are, there are enough red herrings to make you guess it could be anyone, which once again is only a good thing for the premise. Noah sums up it all up with a delightful speech that would have made Randy proud. He states that to make a Slash TV show work, you need to be slow, get to care for the characters so when they do die, it will hurt you as a viewer. 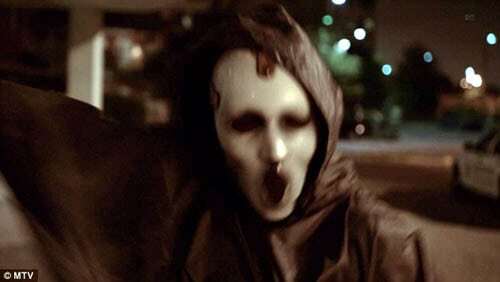 At the moment I could not care less who dies or survives, but thanks to a brilliant show-reel of what’s to come and seeing Ghostface in all his glory in future episodes I am on board for the ride. Its not the Scream we know and love, but at the moment, thanks to a surreal opening 60 minutes, it shows minor potential if only for that back story and besides…… it has to better than Scream 3?? Surely!!!! 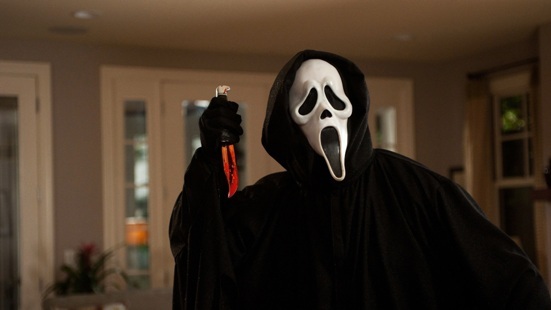 TV: ‘Scream’ series moving forward with MTV, Wes Craven to direct pilot?